Creative, intelligent and inspiring, Brad Bird’s Tomorrowland is unlike anything that’s playing in theaters at the moment, or anything we’ve seen in quite some time. 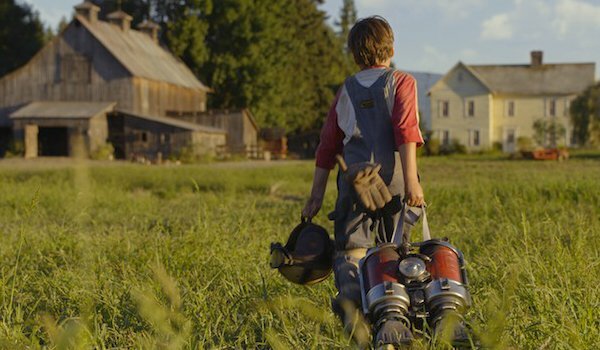 We’ve barely made it one month into the Summer Movie Season, and the multiplexes are crowded with sequels. Familiarity breeds receipts, so if you scan the box office charts, you’ll see three sequels in the top three slots -- Mad Max: Fury Road, Pitch Perfect 2 and The Avengers: Age of Ultron. These blockbusters were preceded by Furious 7 and Paul Blart: Mall Cop 2 -- meaning that half of the films in the current weekend Top 10 are extensions of stories we’ve already consumed. Sequels aren’t evil, though. Most of the films mentioned above prove that it’s possible to advance a formula while entertaining an eager fan base. But sequels can be easy. Movies like Tomorrowland are hard. They require thought. Planning. Risk. They don’t have a pre-established source, or a powerful brand on which to lean. A movie like Tomorrowland asks you to gamble your time and money on an unfamiliar journey. In this instance, though, the risk comes with serious reward. Perhaps its because we have been gorging on a steady diet of THE familiar that Brad Bird’s Tomorrowland strummed the chords of my imagination with its whimsical science-fiction tale. The film’s nostalgia for a knowledgeable era, and its noble messages of hope, inspired me to think bigger as I exited the theater. Hopefully the same sense of inquisitiveness and mystery will prompt you to explore Bird’s wondrous adventure. To help coax you along, I came up with three reasons why Tomorrowland sold me on its look-to-the-skies sense of astonishment. Needless to say, this piece will dig into a few mild Tomorrowland spoilers, but nothing that will ruin the movie for you. Tomorrowland, the fictional location in Brad Bird’s movie, is an alternate land existing in a separate dimension that was created so that the world’s best and brightest thinkers would have a place to experiment free from the imposing wills of politicians and bureaucrats. If geniuses like Thomas Edison, Jules Verne or Nikola Tesla could imagine it, they could work together to build it in Tomorrowland. 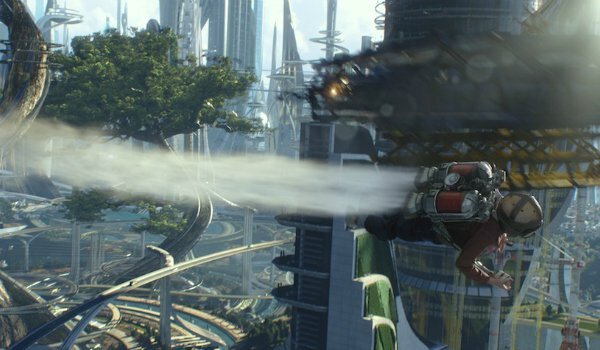 The bulk of the movie follows young Casey Newton (Britt Robertson) on her quest to find a "gate" into Tomorrowland from our world – a mission that pairs her with both an aging and bitter inventor (George Clooney) and a pint-sized robot (Raffey Cassidy). But it’s the reason Casey is "chosen" for this adventure that helps Tomorrowland stand out. She’s an intelligent optimist with a rebellious streak, a big-picture thinker who’d rather analyze the world’s problems than use them as an excuse for her own failures. And when it’s time to reestablish Tomorrowland as a thriving hub for creative thought, Casey is the driving force to recruit new artists, inventors, teachers, learners, activists, entrepreneurs… problem solvers. Tomorrowland recognizes our current culture born of a fascination with Armageddon, a post-apocalyptic, pop-culture landscape littered with the Mad Max’s, Walking Dead’s and Last Man On Earth’s of the world. That content had its time. Tomorrowland asks why we can’t think positively every once in a while, starting now. 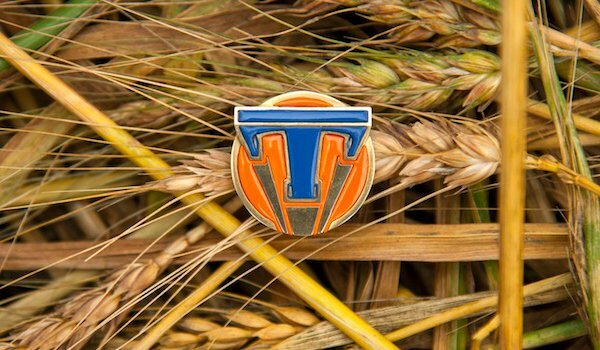 There’s a visual gag in Tomorrowland that’s so adorably creative, it became the centerpiece of the film’s marketing campaign. Athena, the robot recruiter, lures thinkers and dreamers to Tomorrowland by passing them the pin seen in the pic above. By infusing the pin with one’s DNA, she’s able to turn the trinket into a conduit that shows them Tomorrowland – even though their physical form remains on Earth. This is one of the many imaginative flourishes that, in Brad Bird’s hands, become unforgettable tricks of filmmaking wizardry that will keep you giggling through Tomorrowland. Tomorrowland continues an ongoing "How did they do that?" conversation that many of us started during Mad Max. But the wonder and mystery of Tomorrowland isn’t limited to the pin. During a slam-bang shootout in a Houston comic-book shop, Bird relies on every single prop from our collective, pop-culture memories – from a frozen-in-carbonite Han Solo to, of course, The Incredibles action figures – to keep Casey out of danger. When Casey finally finds Frank (George Clooney), the two rely on impossibly creative gadgets in a sci-fi funhouse to ward off robot attackers. At one point in the film, during a scene hinted at in the trailers, the Eiffel Tower converts into a rocket ship capable of shifting between dimensions. And the realm of Tomorrowland, itself, is a magical environment inspired by theme park attractions found on Disney playgrounds in both Orlando and Anaheim. It’s enthralling, seeing these imaginative set pieces come to life on screen, and Tomorrowland shows how Bird continues to grow and mature as a live-action filmmaker after conquering animation in gems like The Iron Giant, Ratatouille and The Incredibles. You might have reached this conclusion already, reading about rocket ships hidden in the Eiffel Tower or smiling robots invading George Clooney’s fortress of solitude (which he and Britt Robertson escape via a catapulted bathtub). But it’s worth repeating that Tomorrowland is simply the most original, inventive and unpredictable movie in theaters at the moment, and curious audience members who enjoy mystery and intrigue should celebrate it. With all due respect to the fourth Mad Max or the tenth Marvel movie, we kind of know what we are getting in to when we pony up the dough for those stories. Brad Bird and Damon Lindelof hatched Tomorrowland from seed, and while it isn’t without fault, it meanders and expands in ways you couldn’t possibly predict. The visuals are stunning (IMAX is a necessity for this feature), the acting’s top notch, and the movie will challenge you on multiple levels – whether you agree with its concepts or not. During a time when movie studios frequently hope ticket buyers turn their brains off to enjoy superficial thrills, Tomorrowland soars by engaging our imaginations, our spirits and our souls. It’s a rich and rewarding movie-going experience, and one I can’t wait to embark on again, soon.